Los Angeles – Do You Like Theatre or Not? This week, thousands of this country’s theater industry professionals will embark on the city of Los Angeles for the 50th annual Theater Communications Group conference. Theater Communications Group, commonly referred to as TCG, is an organization that represents and advocates for nonprofit theaters in the United States. One issue being brought up at this conference (and something thought about daily by local theaters) is whether Los Angeles is a theater town, and if not, how do we make it one. Unlike other major cities in the country that can claim with confidence that they are “theater towns” – New York, Chicago and San Francisco – Los Angeles has one major obstacle that those other cities don’t. That obstacle is none other than the television and film industry. There is no denying that this detracts many people from much of the amazing theater productions occurring nightly in the Los Angeles area. This issue has never been a question of whether good theater was being made in this city. Many productions that are smash hits on Broadway were originally produced in Los Angeles, two examples being the now classic Angels in America and the current Broadway hit musical Sister Act. The problems involve things that the local theater community has no control over. For one, there is no central area full of theaters like those that call Broadway home. Theaters are instead spread out from International City Theatre in Long Beach to the Mark Taper Forum in downtown Los Angeles to the Geffen in West Los Angeles. Another issue is that many newspapers don’t cover theater like they used to in the past, making it extremely difficult to spread the word about a show. This area certainly isn’t short on talent. There must be a reason why millions of classically trained actors, writers, designers and directors move here to work on our stages. There are dozens of theater companies doing innovative and original work on a nightly basis. 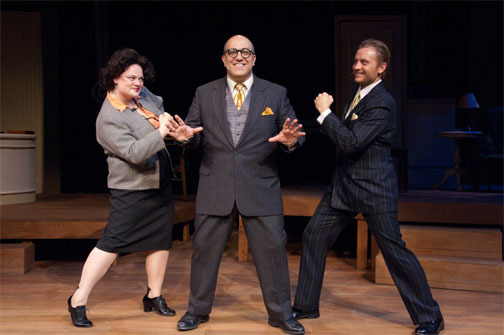 ICT ended its 2010 season with a world premiere musical about Greta Garbo called When Garbo Talks! The quality of the work isn’t an issue here, and there certainly are a significant number of theater enthusiasts that live here. So what do you think? Is Los Angeles a “theater town?” If it isn’t yet, do you think it can be? Perhaps the best question is whether residents of the greater Los Angeles area want its city to be a “theater town” or not. We sure hope so. This entry was posted on Friday, June 17th, 2011 at 4:54 pm	and is filed under Uncategorized. You can follow any responses to this entry through the RSS 2.0 feed. You can leave a response, or trackback from your own site.